Blackjack is a game that is easy to learn, but hard to master. The rules are simple, defeat the dealer by getting a higher point value than them, without exceeding 21. The game can have a varying number of players, but most tables seat about six people. 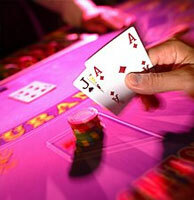 Unlike other card games, Blackjack pits the dealer against each player. So, the players are not really playing against one another, but against the dealer on an individual basis. It is also the case when playing online at top online casino - your only opponent is the dealer anyway. Each player places their wager on the table before the cards are dealt. The players get two cards that are facing up while the dealer only reveals one of their cards. Players are then given the opportunity to take another card, also known as a "hit," until they either bust (go over) or decide to hold. Unlike the players, the dealer has their own set of rules that they must abide by. Most casinos make their dealers hold after they hit 17 points. This rule is implemented so that the dealer rarely goes over, leaving the outcome of the game in the hands of the player. A player can instantly win with a Blackjack, a combination of a 10 card (or a face card) and an Ace, which will earn them a payout of one and a half times your original bet. Blackjack has a unique set of betting rules, some of which may not be allowed at some casinos. A player can purchase insurance and place a side bet against the dealer. This bet can only be placed if the dealer has an Ace card exposed. If the dealer has a Blackjack, they are paid two to one odds while nothing is won if the dealer does not have a Blackjack. Players can surrender at a variety of intervals, each with their own rules and regulations. The basic surrender has the player give up their hand and they only lose half of their bet. An early surrender is allowed if it is performed before the dealer checks for a Blackjack. Finally, a late surrender is allowed after the dealer has checked for a Blackjack, but cannot be preformed if the dealer has a Blackjack. Players can also double down and double their bet after the beginning dealing of the cards. However, only one card can be hit with this bet. The rules to doubling down will vary from casino to casino, but all of them will require you to take an extra card after you double down. If you cash out right away, you can get even money and get a one to one payout if the dealer is showing an Ace and you get a natural Blackjack.